Author(s) Ivester, Thomas; Weiss, Patrice M.; Gluck, Paul A. 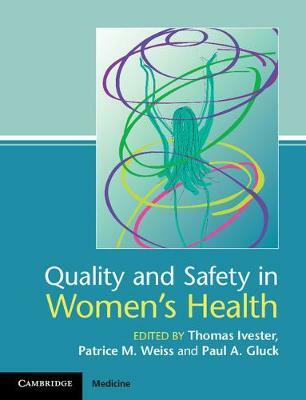 Designed for all providers of women's healthcare - including those undertaking Maintenance of Certification programs, trainees preparing for postgraduate examinations, and those initiating or growing a program of quality improvement and patient safety - this practical manual guides those implementing QI and safety programs with specific emphasis on Obstetrics and Gynecology practice. The content contains a strong case-based element to improve accessibility and understanding. An introductory section covers core attributes needed by all physicians to build a culture of patient safety, including leadership, communication and QI skills. Core clinical skills are then reviewed - in a variety of labor ward, office, operating room, and outpatient settings. Finally systems implications are highlighted, including information transparency and disclosure, training programs, and regulatory and legal implications. The editors are involved with national and international initiatives educating physicians in safety aspects of practice. The book is published in collaboration with the Foundation for EXXcellence.